How well do you ACTUALLY promote your content? It’s all too common for us to do everything we can to make sure that next blog post is published, but once it’s live the foot comes off the pedal. If you want to see results from content marketing, you need to have a well-oiled step-by-step promotion process that you repeat every time you hit publish. Anything less and you’ll be disappointed. No shares, no comments, no traffic and unfortunately no leads. We’re wired, in a number of different ways, to share information that delights and inspires us. But most of all we share to form our own identity. The New York Times published a study on the psychology behind sharing on social media, and found that 68% of the study’s respondents said they share to give others a better sense of who they are and what they care about. That same sharing psychology extends to how people share content from the brands that they follow. As marketers, we should aim to delight, surprise, engage, and sometimes provoke our followers to start building their own identity. Because when someone identifies with your message, it accrues trust. Trust is the number one influence on a buying decision. If you want your content to inspire your audience, delight their senses and motivate them to share – you need to create content that talks uniquely to their personality and desires. But that is not enough on its own. Even if you do create that brilliant infographic, e-book, or perfect blog post that talks directly to your ideal customer, if you don’t actively promote that content then your efforts are wasted. 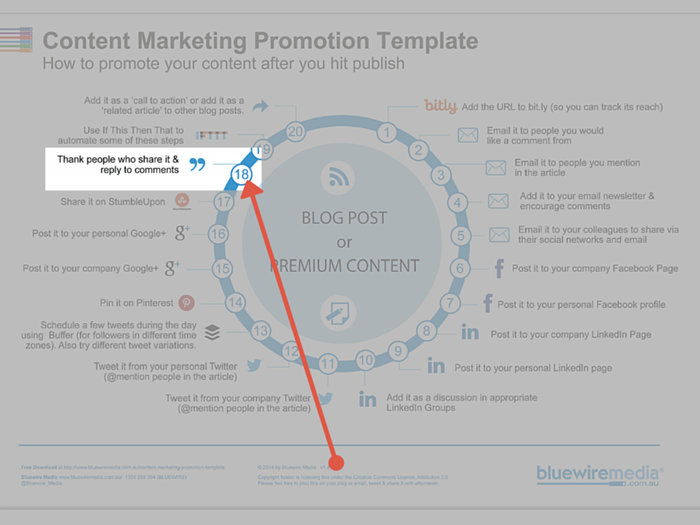 The rest of this post will step you through how to use the Content Marketing Promotion Template. It’s a 20-step checklist for exactly how and where to share your content, after you’ve hit publish. 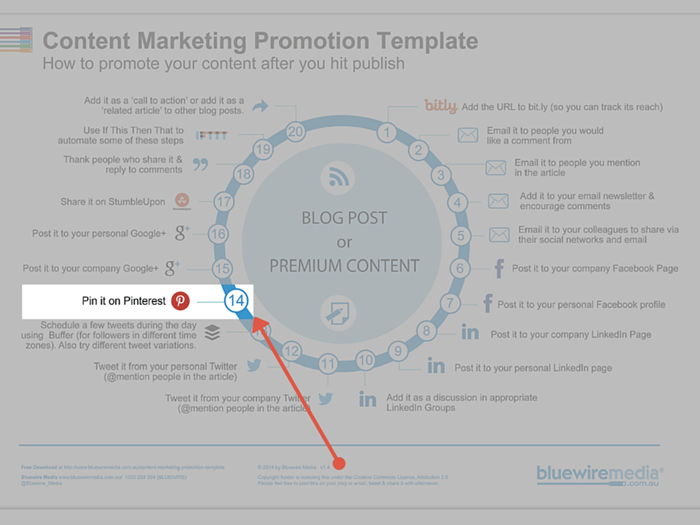 Bonus: Download the “Content Marketing Promotion Template“, your 20-step content marketing promotion strategy for once you hit publish on your next blog post. First things first – after you publish on your blog post or piece of premium content, create a bit.ly link for the page where that content lives. Bit.ly shortens your links (and you can personalise them) so they’re easier to track and share. The platform also provides insight on how popular your content is, and you’ll be able to collect data on which one of your online channels are performing the best. Next up – share your content through email. Be sure to send the link to anyone that you’ve quoted or referred to in your content. Include the content in your regular newsletter and invite your subscribers to leave comments. Send a message to colleagues or anyone else that you’d like to comment on the blog. Remember that personalisation is the key in your email copy. It should sound like it’s coming from you (because it is), and if you have a relationship with who you’re emailing (you should), provide the right context for your message. Our next channel is Facebook. Post your content to your company Facebook page, and your own personal page. Note that you’ll want to craft a brief message with the link that you share. In a study from Buffer, they found that Facebook posts with 40 characters receive 86% more engagement than those with a higher character count. Here’s a great example of what a post should look like, from mindbodygreen, a health and wellness site. Head over to LinkedIn next, and share the blog post there as well. On your personal page, your company’s LinkedIn page, and then in any professional groups that you might belong to (where it’s relevant). Only 57% of companies actually have a company page on LinkedIn, so if you still haven’t created yours, there’s time to jump on the bandwagon and help your marketing efforts – Google’s search engine crawls LinkedIn pages, too. Twitter is up next on your sharing list – remember to keep the length of your tweet under 100 characters so that people can re-tweet it and add in their own comments. Also note that brands who tweet on weekends tend to get more engagement – 17% more, to be exact. Be sure to tweet from both your personal and company Twitter account, and @mention anyone that you refer to in your blog post (that means their audience will see the tweet too). Include a picture with your tweet will increase your chances of engagement – but remember to keep it under the character limit. If you’re not automating your social media posts, you’re wasting a lot of time. Schedule a couple more tweets to go out about the blog post that day – you’ll want to test when your audience is actually online and find the best times to engage with them. Tools like Buffer are excellent for scheduling and managing your social media activity, and they offer business and enterprise plans if you’re managing a lot of accounts. Next, head to Pinterest where you can share a relevant image for the piece of content to get people over to your blog. Pinterest is a great resource, and one that often gets overlooked. Which just means there’s more opportunity for your content to go viral – over 80% of pins on Pinterest are re-pins (shared by multiple Pinterest accounts). Google+ is up next,make sure to post to your company and personal Google+ pages. It’s highly debated whether or not it’s worth it for brands to have a Google+ page, simply because there are less users on Google+ than there are on other platforms. But recent studies have shown that brands still have a level of engagement on Google+ that is on par with Facebook, and double the engagement that they get on Twitter. Help drive more traffic to your site by sharing it on StumbleUpon. Yes, you read that correctly. StumbleUpon is still a very relevant (and useful) platform for marketers, beating out sites like Reddit and Digg when it comes to traffic generating. Crazy, right? But true. You can also use a resource like If This Then That (IFTTT) to automate more of these steps. IFTTT allows you to create “recipes” for automating tasks – for instance, if you sync your Instagram and Dropbox account, you can set up an IFTTT recipe to automatically save any photo that you post to Instagram in your Dropbox folder. Just because you’ve shared and posted your blog to all of these channels doesn’t mean your work is done. Thank everyone who has commented on your post, and respond to any tweets or Facebook comments that come up. You’ve managed to inspire (or at least elicit a comment) from your readers, so you want to use that momentum to your advantage. To keep traffic buzzing around the content on your site, continue to link to it in subsequent blog posts or newsletters as a “related article” or call-to-action. This is great for SEO. For example, Vice recently published an article about beauty pageants for cows. The article includes a few other “Recommended” articles that are populated on the same page. After reading all about cow beauty pageants, readers can click through to another article about a similar topic. They’re keeping people on their website with enticing images and savvy article titles. The best blog article ever written will go unnoticed if it’s not promoted effectively. In the same respect, a poorly written blog article can outperform much better content if it IS promoted effectively. Content promotion is the difference between successful content marketing and a stale, frustrated, and unfulfilled blog. People give up far too easily when it comes to creating content, and it’s usually because they don’t see results. Content promotion helps you see results quicker, and with more precision. How do you share your content? What do you automate? Or are you guilty of hitting publish and HOPING the traffic will come in?